We made it and are so happy to be here in Dublin. What a dream come true. It took 24 hours via St. Johns Nfld. We had a 6 hour lay over but since I had never been there before, I found that quite exciting. Mon and I grabbed a cab from the airport and headed for George Street for some dinner. Great food, great music. Then we flew all night and arrived in Dublin at 7:30 Tuesday morning. 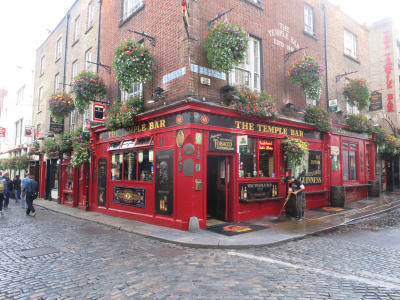 Caught the Airlink bus downtown, found our hotel at 9:00 (The Arlington Hotel on the Liffey River a two minute walk to the downtown core), stashed our bags and did a quick walk about the downtown to get our bearings. Soon our hotel room was ready and we freshened up before heading out to catch the hop on, hop off bus for an afternoon tour around the city. 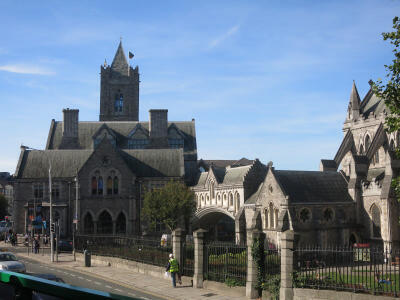 Highlights were: St. Patrick’s Cathedral (unbelievably amazing for the history and priceless artifacts), John’s Lane Church (Harry Clarke stained glass windows) and the Guinness Storehouse where we toured the beer making process ending with a tasting on the 9th floor with an unbroken 360 degree view of the city. Dinner was at Arthur’s (as in Arthur Guinness) where I had the best shepherd’s pie made with lamb. The weather is beautiful (so far), the sight seeing is unbelievable (the stained glass!!! ), the people are wonderful and the food is amazing. After 36 hours with no sleep, we were too tired this evening to do much other that slip out for a couple of night shots and then to bed for a good night’s sleep. Tomorrow will be a full day. Here is the photo reel of the day’s highlights. NOTE: WordPress image gallery is acting up lately…sometime it freezes … so be warned. I’m working on a fix but for now may just have to live with it as is. I’ve inserted the day’s photos as a running slide show which won’t freeze (hopefully). Wow, a blog up already! You are dedicated and we thank you. Wonderful photos of a very busy 24 hours. Your dream trip is off to a great start!